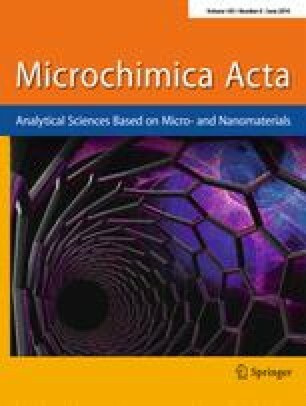 The authors describe a turn-on luminescence resonance energy transfer (LRET) method for the detection of the mycotoxin Ochratoxin A (OTA). It utilizes upconversion nanoparticles (UCNPs) of the type NaYF4: Yb, Er as the energy donor and gold nanorods (Au NRs) as the acceptor. Biotin-labeled OTA aptamers were bound to the surface of the avidin-functionalized UCNPs. The AuNRs, in turn, were modified with thiolated OTA aptamer cDNA via thiol chemistry. The emission band of the UCNPs under 980-nm laser excitation has a maximum peaking at 657 nm and overlaps the absorption band of the AuNRs which peaks at 660 nm. Quenching of luminescence occurs because the hybridization actions shorten the distance between UCNPs and AuNRs. If, however, OTA is added, the two kinds of particles separate again because of the high affinity between OTA and the OTA aptamer. As a result, luminescence is recovered. The calibration plot is linear in the 0.05 to 100 ng mL−1 OTA concentration range, and the limit of detection is 27 pg mL−1. The method was successfully applied to the determination of OTA in beer. The luminescence of aptamer-modified upconversion nanoparticles (avidin-UCNPs) is quenched by cDNA-modified gold nanorods (AuNRs) due to hybridization. In the presence of Ochratoxin A (OTA), however, the luminescence of the UCNPs recovers due to competitive binding of aptamer to OTA. The online version of this article (doi: 10.1007/s00604-016-1820-9) contains supplementary material, which is available to authorized users. This work was partly supported by the National S&T Support Program of China (2015BAD17B02), National Natural Science Foundation of China (21375049, 31401576), JUSRP51309A and Synergetic Innovation Center of Food Safety and Quality Control of Jiangsu Province.